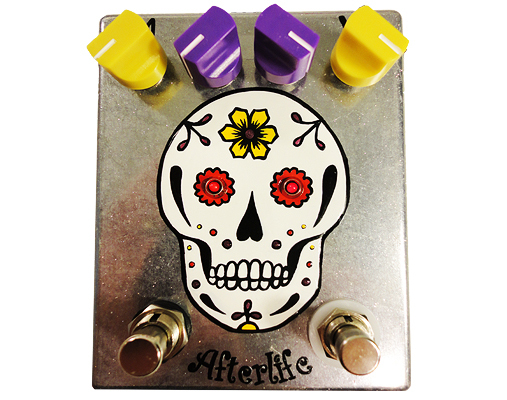 AFTERLIFE is our reverb pedal that does more and looks more fun than you’re plain old reverb pedal. Sprung from a conversation with Young Widows, they sparked the idea for a reverb that is lush, controllable in decay, AND offers a second output that sends a totally wet reverbed signal with zero dry signal. You can send the second output to the second input of your amp or even your second amp for a bi-amp setup. When both outputs are utilized, a jangly, seasick, back and forth sound occurs. When the Repeats 1 knob is set to a longer repeats setting, you can get some insane oscillation! If R2 is dimed, when you hold down the left footswitch, you’ll achieve hella oscillations! …but wait! THERE’S MORE!!! When the pedal is on/active, you can use the 2nd footswitch to jump between “Repeats 1” and “Repeats 2” for two repeats settings (think short decay/long oscillating decay). When the pedal is off, if the “Repeats 2” knob is fully clockwise, the second momentary footswitch sends oscillation to the second output. Please note that when the pedal is bypassed, output 2 will output NO sound (unless R2 is dimed and you’re holding down the left footswitch). This is a Belton brick-based reverb based on the D Verb. and for ecological concerns related to the use and disposal of batteries. An external power supply is required to use thus pedal.